It's been a while.I have been longing to write for quite sometime.I am not really sure if I was just too busy doing a lot of things lately or I just simply lost the interest to write.I honestly think that there's a lot of things that I wanted to say but I just don't know how to say it. 2008 had a good start. Before the year 2007 ended, I went to Baguio with some friends from PEx.we decided to stay in La Trinidad,Benguet, which is just 20-30 minutes away from the city.We decided not to stay in the city because the sight there was really disgusting and disappointing (pollution , traffic,garbages everywhere, foul smell of the air etc).We all agreed that Baguio is not the same as it was a few years ago. We had our lunch at Rosebowl (very good food ), we also went to Strawberry farm, we cooked using the fresh veggies we bought from Baguio Market and we decided to swim somewhere in Asin Benguet.I had my first experience of sulphuric swimming pool, which they say is therapeautic.I find it weird that we went all the way to Baguio to swim on a cold December.But I dont care, it was fun.I had a great time with the company I was with and it made me forget all the not so good things that happened in 2007. 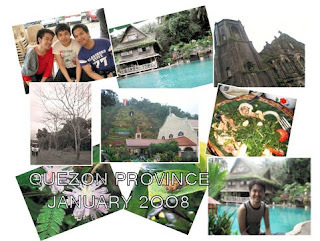 By the last week of January, I was invited to go to Quezon by my good friend Genesis to celebrate his Birthday. It was my first time in Quezon and I had a great time too.I felt really close to nature that time,I did appreciate the beauty of the province, the green surrounding,the mountains,the fields,it was really relaxing to see these things.The house where we stayed in is on a hill,there was a pool where the running water came all the way from Mount Banahaw.I also enjoyed the food that were served , they were all fresh and healthy. We also went to Kamay ni Hesus Healing Church in Lucban, where I made a wish when I reached the huge statue of Jesus on top of the mountain after climbing hundred steps.The trip to Quezon was really memorable. 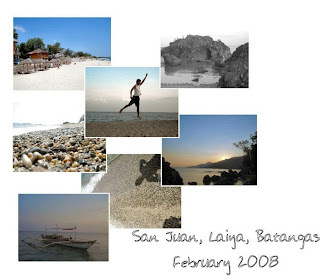 A week after the Quezon Trip, my best buddy John and I went to a beach somewhere in Laiya Batangas.I have been to a lot of beaches already but I would consider San Juan beach as one of the beach beaches I've been so far. It was so relaxing even if you'll just sit somewhere in this beach,watch the sea and listen to the waves or just wait for the sun to set in the late afternoon.There's a lot to do here but my favorite one will be watching the sunset.Emote di ba?Hahaha.It was also my first time to try kayak-ing and it was really fun. Ang sakit nga lang sa katawan.Haha. I dunno but there is something in that place that makes me want to come back. 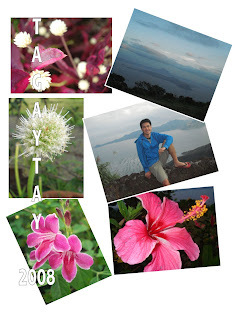 We went to Tagaytay after that and dined at Gerry's to celebrate John's Birthday.